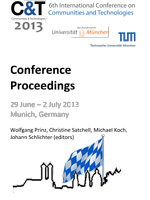 Proceedings of the 6th Communities and Technologies Conference 2013, Munich Germany. Edited by Wolfgang Prinz, Christine Satchell, Michael Koch, Johann Schlichter. Published by ACM and the European Society for Socially Embedded Technologies (EUSSET).